I must apologize for not choosing the 4-year Blogiversary Giveaway winner last week like I said I would. Sorry. I totally blanked. 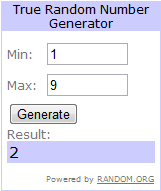 But random.org has finally chosen one and the winner is Jen! Jen – email me and let me know where you’d like to spend your $25! Congrats and thanks for reading. Speaking of money, I just spent $108.95 on the Brooks Nightlife Speedy Bullet jacket (yes, the yellow one). I’m still not completely sold on it, so I made sure that I could return the jacket if I don’t like it. It’s just so much money! All I’m saying is that it better make me run faster. Speaking of running (you see how nicely these all segue together? ), I did my longest run since November 2010 on Saturday: 9.64 miles (but we’ll round it to 10). I was looking forward to the run on Friday and even when I woke up Saturday morning. I checked the weather and determined that it would be warmest around 1 pm. So instead of running in the cold at sunrise, I had coffee with a friend, ran errands with Travis and then took a nap before heading out on my run around 2 pm. By then, I wasn’t feeling the run as much. But at least it was a gorgeous day – I wore my 2XU compression tights and a t-shirt. Glorious. I took the pooches around the lake for 1.55 miles, dropped them off, and then did another 8.1 miles (I thought it would be 8.5 but I didn’t check the route before I left) in a loop that I had only done on my bike before. I figured it would be good to explore new territory (for sanity and safety) and I knew that these trails would be packed with people on such a nice day. For the first 5 miles of that 8-mile loop, I was pretty indifferent about running. I wasn’t necessarily enjoying it, but I wasn’t hating it either. But the last 3 miles, I felt pretty good. Half a mile from home, I thought, Another 3 miles wouldn’t be that bad. After my run, I decided it was time for my first epsom salt bath – the ice bath alternative. I filled the tub up with warm water, added 2 cups of epsom salts (found at my local dollar store! ), and read my book for 15 minutes while soaking in relief from sore muscles. I’ve never taken an ice bath so I can’t comment on how that feels afterward, but my legs felt pretty great after the epsom salt bath. Not nearly as sore as they have from other runs. So I’ll call that a success! But I’ve noticed that when I use the iMapMyRun app on my phone to record my workout, it estimates the distance longer than if I manually map it out online. My Thursday run was recorded as 4.18 but mapped as 3.98. 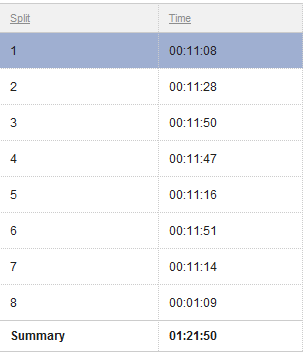 And this run was recorded as 8.1 but mapped as 7.88. Obviously, I’d like to believe the recording. I asked Travis about it and he said that if anything, the GPS on my phone would record it too short, not too long. What do you think? I’m thinking your phone is more accurate. I’ve used sites like mapmyrun.com to map out runs before – what looks right as I map it is obviously cutting corners when I zoom way in. Have you tried zooming all the way in when tracking online?! PS…great run! The weather was great on Saturday, glad you got out to enjoy it! Double PS – I’ve tried ice baths but no salty baths…maybe I’ll have to give it a shot, sounds much less painful! @Erin – that’s what I was thinking too! @Mel – the app does show me a map and it looks a little choppy but if my phone dropped my signal for a few seconds and then picked up where I was, wouldn’t that make my run shorter than it is? @Heidi – that could be it. My mapping is definitely not flawless, although I try to be pretty accurate. And you should definitely try a salty bath. I can’t imagine the misery of an ice bath. Woohoo!! I’m so excited Kathy! I was just catching up on your blog and came to this post and was STUNNED that I was the winner! I actually said “ME?” aloud in our kitchen! Thanks for such a fun gift! Now, to think of how to use it… Thanks again friend!